I think I just need to get used to the fact that the first month, more like month and a half, of school EVERY SINGLE YEAR is going to feel like I'm drowning and can't keep my head above water. This is my 13th year teaching. But somehow, although it IS easier, it is still tough. There is very little sleep to be had, hours of planning each week, and clearly no time to share any of this with anyone - like you wonderful people who visit my blog. You can see a pattern in my blogging history with my lack of posts in September and October. I guess I have to just admit it - I cannot do it all and I will never pretend that I can. Please tell me I am not the only one. With that being said - I do still want to share ideas when I have the time to do so and I really love knowing that some teachers find their way here and take time out of their busy schedules to read what I have to say. It's an honor! So let's jump right into Halloween, shall we? The last couple years I have been loving all things witchy around Halloween time. This bulletin board has appeared two times so far and I just LOVE putting it up. When the kids come to school the day after this goes up they just stop and smile. Some of them try to high five the witch. It just makes my day! Can I get a Woot! Woot!! 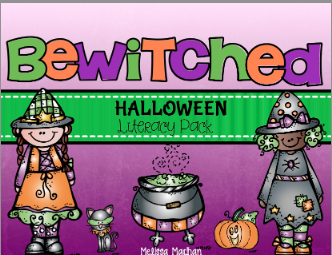 I'm just so excited to introduce my Halloween literacy pack: Bewitched. I've loved watching this come together and now am finally able to share it all with you! I'll start with my favorite part. 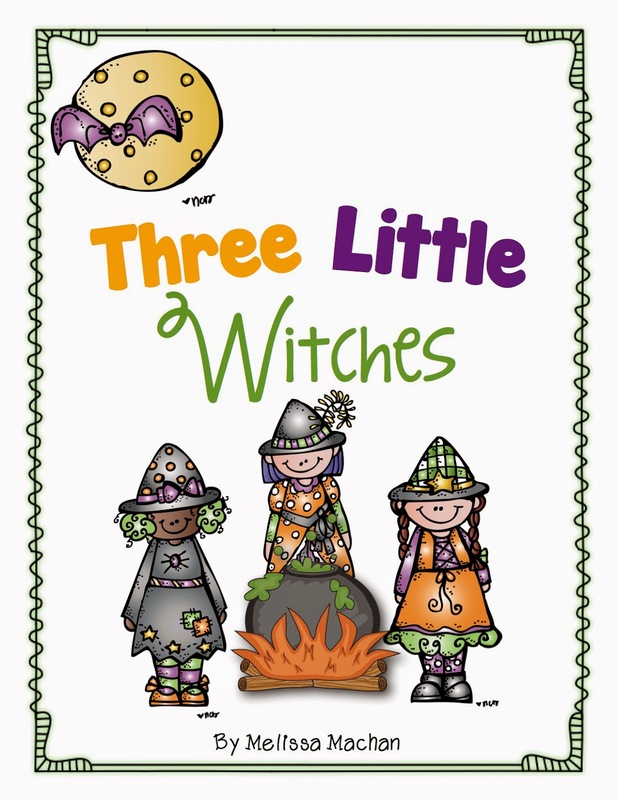 This original story was inspired by the poem Five Little Pumpkins and is called Three Little Witches. I was lucky enough (and so honored) to have Nikki from Melonheadz design a custom set of clipart to go with my story and I just adore them!!!! She is Ah-mazing!!! This next part is always a favorite of my kiddos so I wanted to include it and spice it up a little. 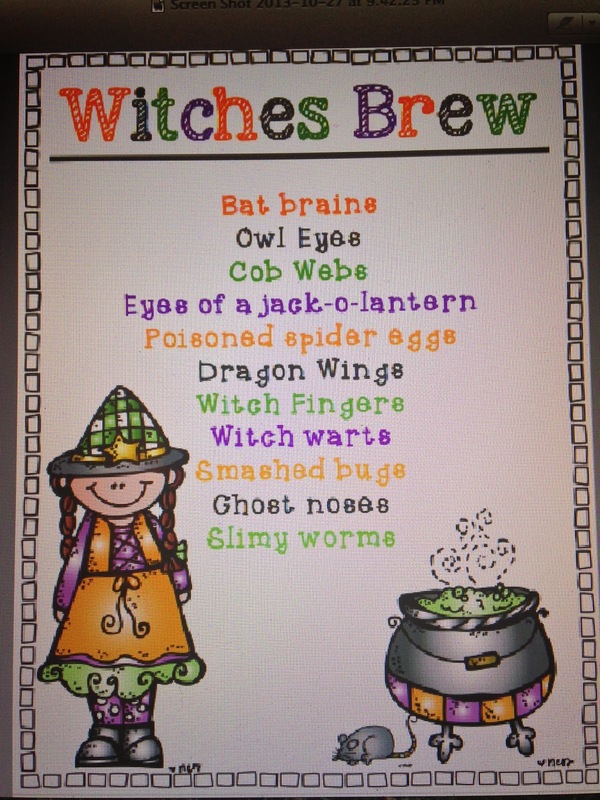 Along with the Witches' Brew recipe I included labels for your bags (cuter than my handwritten ones) and an adorable writing craftivity where students create their own Witches' Brew recipe. We had tons of fun with this one. In order to create the recipe we needed to review nouns and adjectives so I included a center for that. 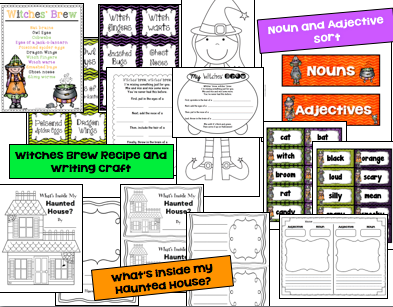 To add onto the nouns and adjectives center, I included a haunted house writing activity. 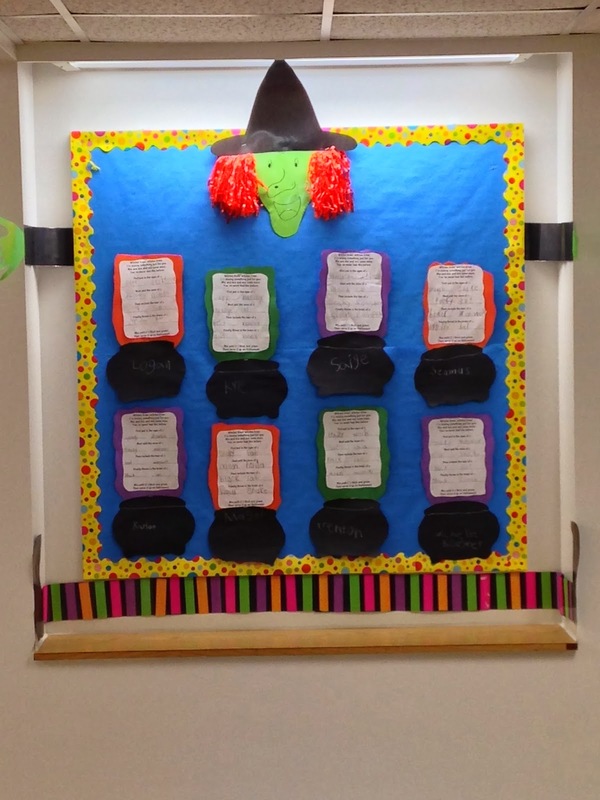 Students can create a book, or you can make a class book, called What's Inside My Haunted House? Kids just love talking about oozing eyeballs and hairy spiders and whatever else might show up in their haunted houses. Gross, but oh so fun! 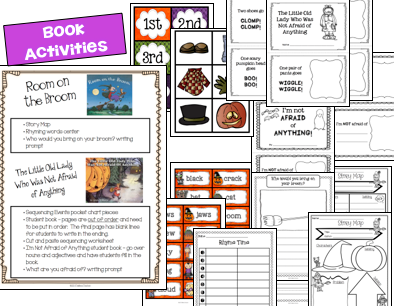 I also added some activities to go along with two of my favorite Halloween read alouds: Room on the Broom and The Little Old Lady That Was Not Afraid of Anything. 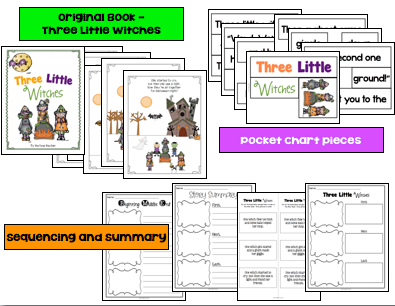 I included sequencing, rhyming words, story maps, and a few more writing activities. 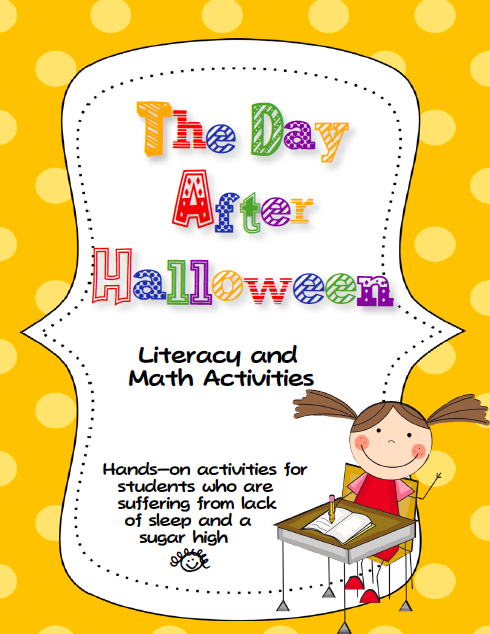 If you are looking for some more activities to add to your Halloween repertoire then I hope you'll check out this pack. Or if you are also just trying to get ahead, maybe this will help you so you don't have to feel like you are drowning.